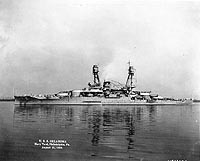 USS Oklahoma, a 27,500-ton Nevada class battleship, was built at Camden, New Jersey. She was commissioned in May 1916 and generally operated in the Atlantic over the next five years. 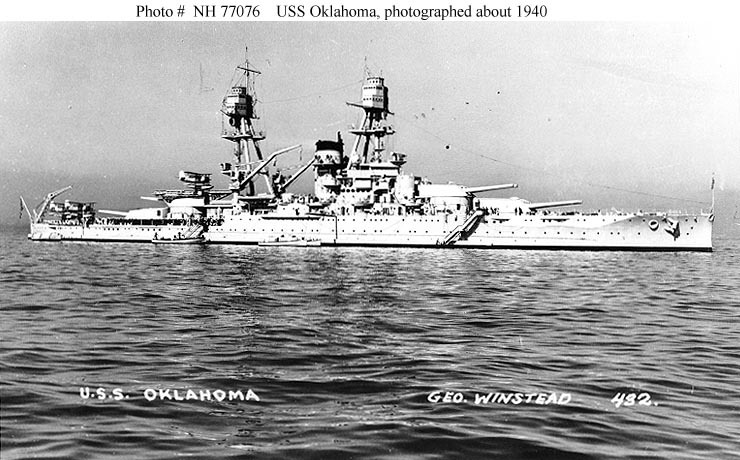 In mid-1918, Oklahoma went to European waters to help protect convoys. Late in that year and in June 1919 she escorted President Wilson during his voyages to and from France. 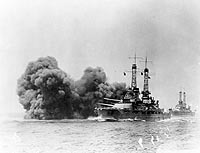 In 1921, the battleship moved to the Pacific, visiting the west coast of South America prior to joining the Pacific Fleet. 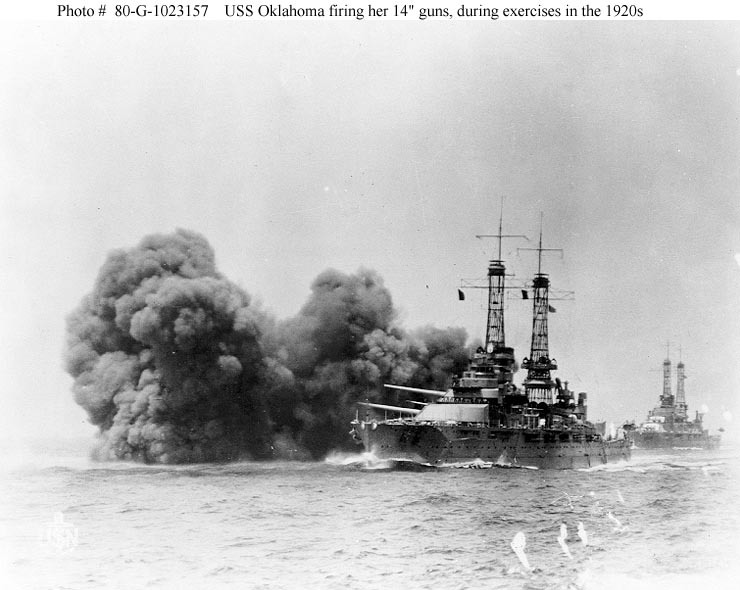 During most of the rest of the decade, Oklahoma served with the Battle Fleet during its many exercises, drills and Fleet Problems. She participated in the Fleet's trans-Pacific cruise to Australia and New Zealand in mid-1925. In the summer of 1927, she transported Naval Academy Midshipmen from the east to the west coast during their annual training cruise. Oklahoma was modernized at the Philadelphia Navy Yard in 1927-29, emerging with a greatly altered appearance and notably improved battleworthiness. After brief service with the Scouting Fleet, she returned to the Pacific in mid-1930, and renewed her participation in the Battle Fleet's activities. In July 1936, Oklahoma was sent to Europe to help evacuate U.S. citizens and others during the Spanish Civil War. She rejoined the Battle Fleet in the Pacific later in the year. In 1940, Oklahoma's base was shifted from the U.S. west coast to Pearl Harbor, Hawaii. She was at Pearl Harbor when the Japanese attacked on 7 December 1941. Moored outboard of USS Maryland (BB-46), she was hit by a great number of Japanese Type 91 aerial torpedoes. 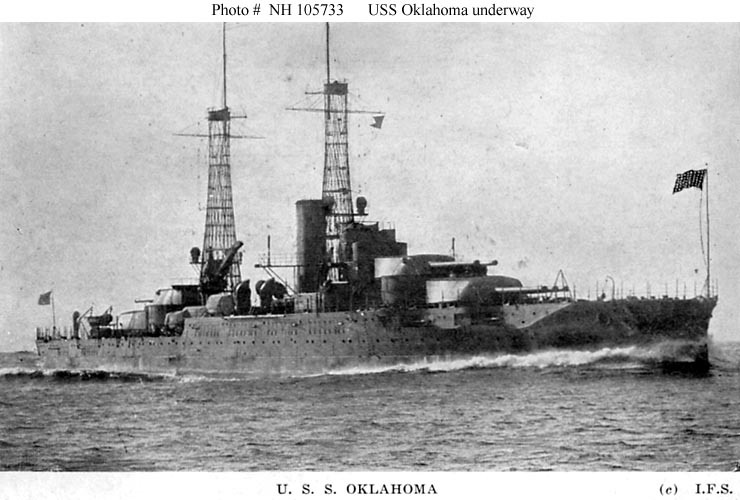 With her port side torn open over much of its length, Oklahoma rapidly rolled over and sank to the harbor bottom, with the loss of over 400 of her crew. Many of the men trapped in her upturned hull were cut free through the intense efforts of Sailors and civilian Navy Yard employees. 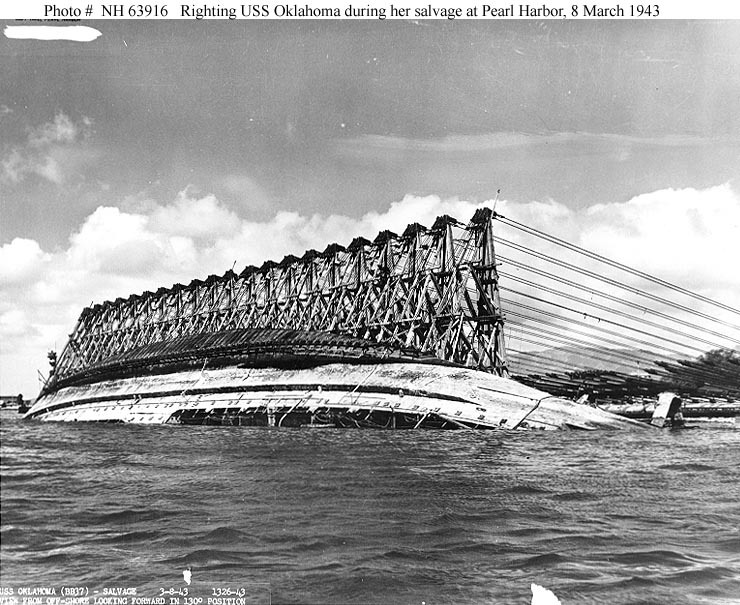 During 1943, Oklahoma was the subject of a massive salvage undertaking, involving turning her upright, patching her damages and refloating her. She was drydocked late in the year to be stripped of guns and other equipment and repaired sufficiently to make her relatively watertight. 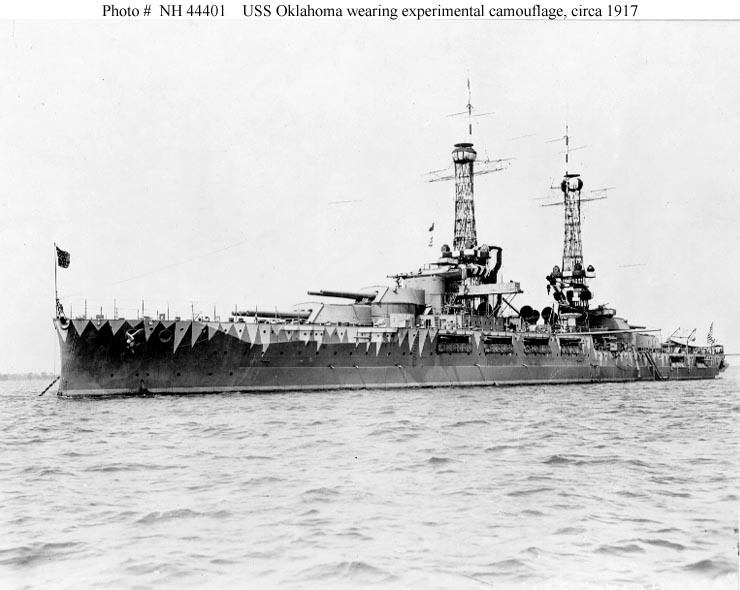 Too old and badly damaged to be worth returning to service, Oklahoma was formally decommissioned in September 1944. She was sold for scrapping in December 1946, but sank while under tow from Hawaii to California in May 1947. 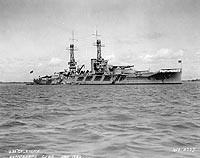 This page features selected views concerning USS Oklahoma (Battleship # 37, later BB-37). 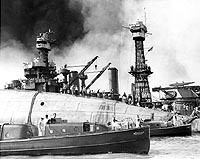 USS Oklahoma (Battleship # 37, later BB-37) -- On Board and Close Up Views. 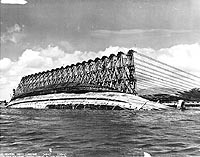 Salvage of USS Oklahoma, 1942-1944. Halftone reproduction of a photograph taken as the ship was running trials, circa early 1916. 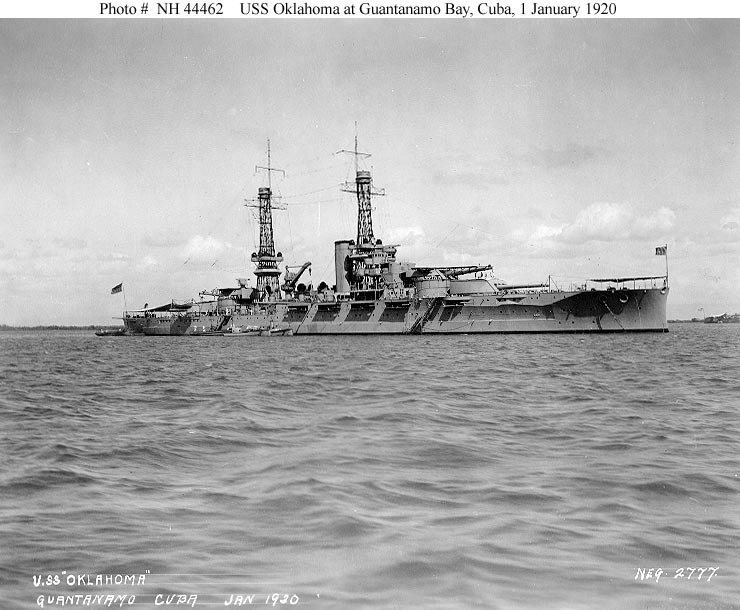 This view was published circa 1919 as one of ten images in a "Souvenir Folder" concerning USS Oklahoma. Photographed circa 1917, while painted in an experimental camouflage pattern. Anchored in Guantanamo Bay, Cuba, 7 April 1919. Panoramic photograph by L.C. Grant with Falk Photo Company, Boston, Massachusetts. Note the steam launch in the center foreground, and the wavy nature of the image, the result of the rocking of the photographer's boat as the panoramic camera scanned along Oklahoma's length. At Guantanamo Bay, Cuba, on 1 January 1920. Note aircraft flying-off platforms installed atop her second and third main battery gun turrets. 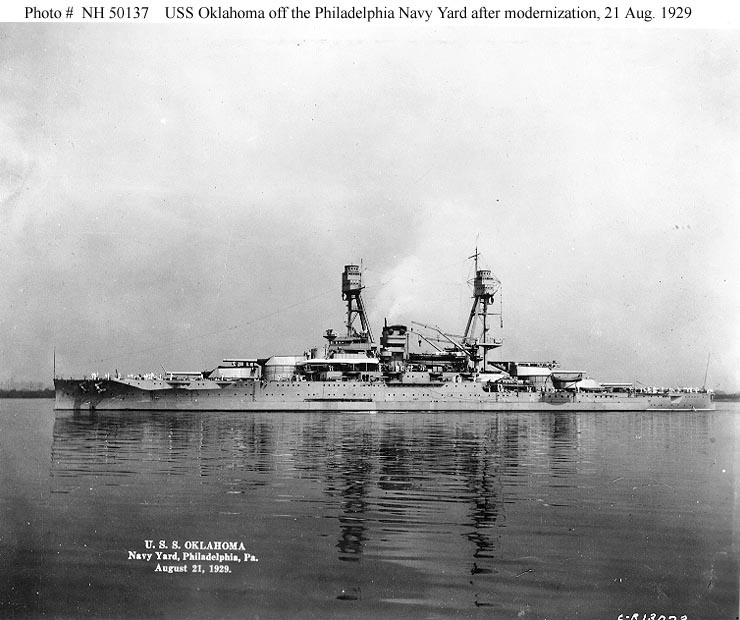 Off the Philadelphia Navy Yard, Pennsylvania, on 21 August 1929, following modernization. 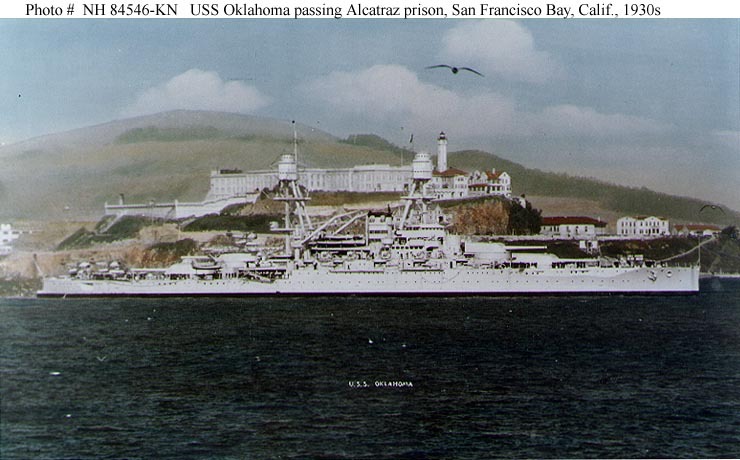 Passing Alcatraz prison, San Francisco Bay, California, during the 1930s. Courtesy of the USS Oklahoma Association, 1975. Collection of Irvin Barrett. Photographed circa 1940, with SOC seaplanes on her catapults. Collection of Vice Admiral George C. Dyer, USN (Retired). Firing her 14"/45 main battery guns during exercises in the early 1920s. USS Nevada (BB-36) is the next battleship in line. 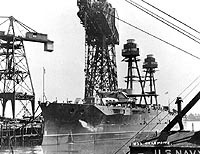 Undergoing modernization at the Philadelphia Navy Yard, circa 1928. Installation of her new tripod masts is well along, but the rest of her superstructure must still be fitted. Donation of Lieutenant Gustave Freret, USN (Retired), 1971. Rescue teams at work on the capsized hull of USS Oklahoma (BB-37), seeking crew members trapped inside, 7 December 1941. The starboard bilge keel is visible at the top of the upturned hull. Officers' Motor Boats from Oklahoma and USS Argonne (AG-31) are in the foreground. USS Maryland (BB-46) is in the background. The capsized battleship is rotated upright, while under salvage at Pearl Harbor, Hawaii, on 8 March 1943. This view looks forward, with the ship in the 130 degree position. Her starboard deck edge is just rising from the water.